Poison aside, frogs are generally weak and pathetic. Dinosaurs, meanwhile, range from weak and pathetic to huge and strong, so I’m going to say they’re generally “not weak.” But 70 million years ago, things were different. Extinct species of frogs like the Beelzebufo ampinga grew to be ten pounds in size. Maybe they even ate the weakest dinosaurs. A team of British, Australian and American scientists realized that these days, frogs generally aren’t known for their jaw strength. But one species of South American horned frogs, Ceratophrys cranwelli, is especially aggressive and can eat animals its own size. 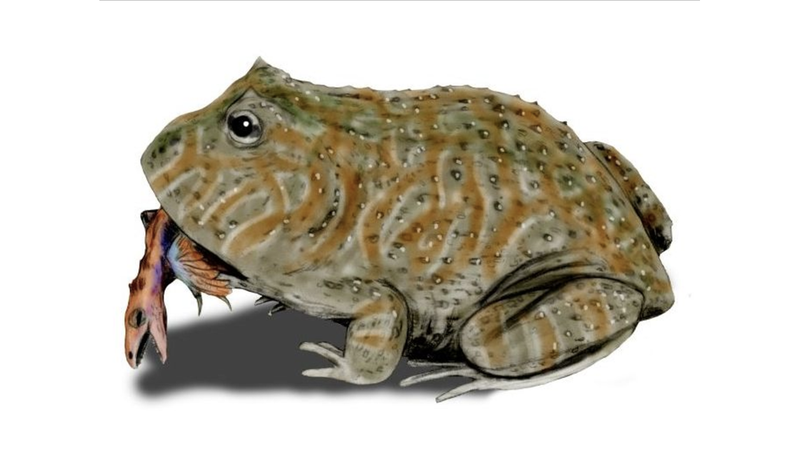 So, thought the researchers, using the C. cranwelli frog as a model, maybe they could estimate how strong of a bite the extinct Beelzebufo had. If you’re not familiar with the Beelzebufo, or “devil frog,” it lived in Madagascar around 65 to 70 million years ago, and it was huge, according to a Nat Geo fact sheet. Scientists already thought that it ate some crazy stuff based on its size, but quantifying the strength of its bite could give researchers a better understanding of its culinary preferences. And indeed, the researchers learned that Beelzebufo’s bite was strong. Very strong. “Our recovered scaling relationship suggests that exceptionally large... extinct giant frogs (Beelzebufo ampinga, Late Cretaceous of Madagascar) probably could bite with forces of 500 to 2200 [Newtons], comparable to medium to large-sized mammalian carnivores,” they write in a paper published today in the journal Scientific Reports. I like science a lot. Anyway, the researchers had the frogs do a lot of biting, then compared the bite force to the frog’s head width. They put that data into a computational model that spits out forces for a given head width, and found that a frog with a 154 millimeter (six inch)-wide head like the Beelzebufo would bite with a force of 2213.7 Newtons, almost 500 pounds of force. Wikipedia tells me that the average force of a human bite at the molar is about a third that number. This is, of course, simply an estimate of the frog’s bite force. The paper points out that, well, the extinct Beelzebufo frog might have had a different jaw muscle setup and skull shape. “Therefore, our estimates of its bite-force performance should be received with caution, as should be the case with any such estimate.” I’ve also passed the paper on to other researchers to see what they might have to say on the matter. I consider myself thankful that I was born a human in the present age and not some other animal 70 million years ago. This frog does not seem like one I’d be interested in sharing a habitat with.